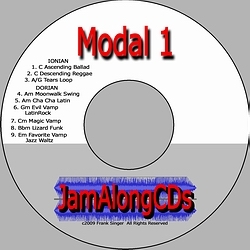 The Jam Along Modal 1 CD is a fun learning tool that provides the opportunity to play along, or sing along, with clear, well-balanced backing tracks that have rock-steady time. With nine instrumental Ionian and Dorian progressions at your disposal, you can jam along any time you want to. These tracks can really help you get the feel of playing in the modes, and make the time spent learning fun and easy. Materials are provided online in PDF format at www.jamalongcds.com/modal1/modal1materials.htm , including all progressions and solo scales for concert pitch, Bb, and Eb instruments.